Susan Landess Pitcher: I have very severe cat allergies, plus asthma, when exposed to cats. 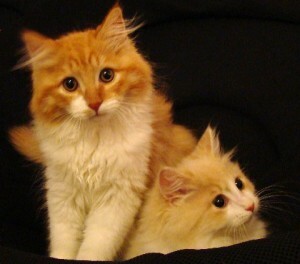 We now have THREE Siberian Forest Cats, all from Croshka, and I have no problem living with them! I can pet them, play with them, cuddle them, etc. For me, this is an absolute miracle and I am very grateful to Croshka for my 3 beautiful furry babies: Leonidas, Orion, and Skylar Gray!! !